With the Belkin N600 DB Wireless Dual-Band USB Adapter, you can connect your computer to your modem or router without any cables. Simply plug the adapter into a USB port on your computer, and you'll connect to the wireless network in your home or office, allowing you to quickly and easily share photos or music, access the Internet, transfer files, and more. 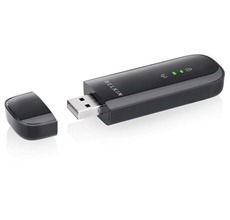 The Belkin N600 DB Wireless Dual-Band USB Adapter runs on dual bands: 2.4 GHz and 5 GHz. By using two bands simultaneously, each providing speeds of up to 300 Mbps, the N600 DB offers optimized performance for streaming HD video or gaming online. Incorporating Wi-Fi security technology, the N600 DB Wireless Dual-Band USB Adapter features WEP and WPA/WPA2 security protocols. Wi-Fi Protected Setup (WPS) makes it easy to configure and enable the security features with the push of a button. Backward-compatible with 802.11a/g devices at 54 Mbps and 802.11b products at 11 Mbps, the N600 DB Wireless Dual-Band USB Adapter can connect to older wireless networks and hotspots as well as newer 802.11n networks and wireless-N devices that offer increased range and connection speed. The N600 DB Wireless Dual-Band USB Adapter requires a CD-ROM drive and an available USB port on a PC running Windows XP (SP3 or greater), Windows Vista (32/64), or Windows 7 (32/64). It works with the Belkin N750 DB Wireless Dual-Band N+ Router, the N600 DB Wireless Dual-Band N+ Router, and the N450 Wireless N+ Router. The N600 DB Wireless Dual-Band USB Adapter is supported by Belkin's two-year limited warranty and 24/7 tech support. N600 DB Wireless Dual-Band USB Adapter, setup CD, and user manual. Red light keeps flashing back and forth with the green why? and what is the WPS button for?